Former Mayor Ed Koch, who is profiled in a new documentary film coming out the first week in February, has, in a rather unusual move, already installed a tombstone at a burial plot he purchased in uptown Trinity Cemetery, Broadway and West 155th Street. Some have articulated some surprise at this, but I don’t think it’s all that outrageous; the Mayor has no children to install a tombstone after his death, and plenty of people get their names chiseled on already erected family headstones in anticipation of their demise. Koch included a quote from Daniel Pearl (who also died on a February 1st), the journalist murdered by terrorists in the aftermath of 9-11-01, as well as a phrase from Deuteronomy 6:4. The Mayor had been in and out of the hospital at age 88 in January 2013, and passed away on February 1. 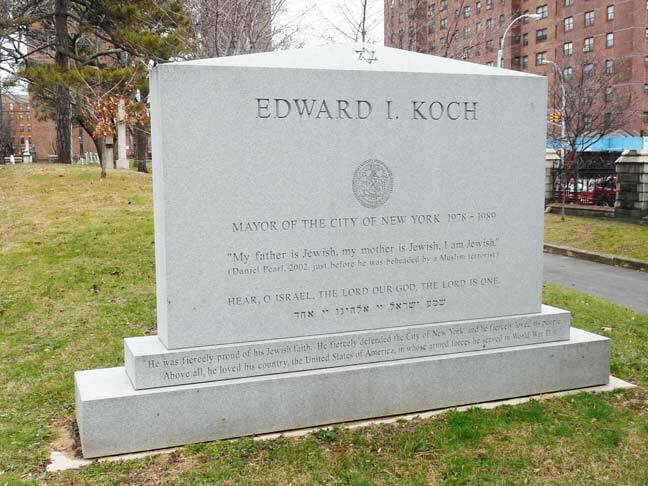 I think it is more to insure a resting place in Manhattan; good for Mayor Koch. I may not always agree with him but I’ve always respected and admired him. ed is one crazy dude. but tells it like it is. he should just come out before he dies. My aunt pre-purchased her arrangements from a Trinity salesman back in the 80’s. We thought it was covered soup-to-nuts – transportation, cremation, service, internment. When the time came I called Trinity and they said the city had shut down their crematory and I would have to make other arrangements to the tune of $900 – but they gave me a $100 credit! When I picked up her remains and brought them to Trinity, I was now informed the container was the wrong size, and would have to be transferred, and that the prepaid arrangements did not include OPENING the niche in the “Wall of Memories” – another $500! I sure hope Ed read all the fine print! Mayer Koch-Rest in Peace. You did fine. Sadly, Ed Koch died today at the age of 88. I’m sure it gave him peace of mind knowing where he was going to be interred. Really enjoyed him as Mayor. He was the real deal as a NYer, born in the Bronx. And very proud of his service to his country. I salute a Great Mayor who truly loved New York City. RIP. Kevin, This was prophetic. RIP Mayor. Carefull the trolls on Byrnerobotics are peeking in here already. I guess they remember that Koch was mayor back when Johnny Byrne’s stuff still sold and he took time and care in his art unlike the low selling dreck he churns out now for a quick buck. The right post at the right time. RIP, your honor. God Bless, Mayor, may you rest in peace. I didn’t know that cemetery was still doing burials these days, though I do think that was someone buried there not too long ago. My last mayor before I moved away. RIP Ed, you’re doing fine. Thank you for your service to our city Mayor Koch. You’ll never be forgotten. “How did you do?” I’m sure we’ll all say “Great”. Ed Koch was possibly the greatest mayor in NY history. Certainly, you would have go go back to Fiorello Laguardia to find a mayor as charismatic and devoted to the city as Koch. After the Wagner, Lindsay and Beam administrations had allowed the city to be run into the ground by the unions, criminals and special interests, Ed Koch came in with strong leadership, vision and pride that rescued NYC from the depths. 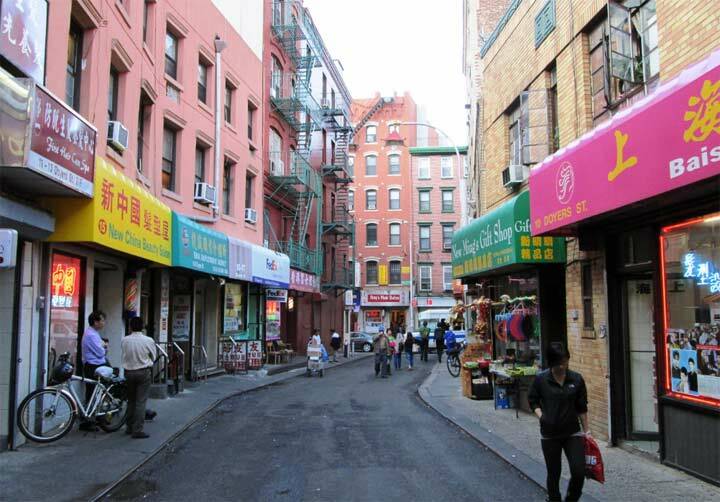 Having lived in NY during the saddest days of decline, I tip my hat to Ed Koch. He was not there to please everyone and, yes, because of that he had enemies and sometimes made mistakes. However, he spoke his mind and should be credited with taking action to save the city and vastly improve the quality of life. You can’t scramble an egg without breaking the shell. He blazed the trail for Giuliani and Bloomberg to continue the cleanup and resurrection (we can forget about the poor performance of his useless successor, David Dinkins). We can all be proud of NYC again and we have Koch to thank for that. A fitting resting place for this turd would have been an unmarked grave at the state prison where they bury paraiahs! Now James, how many times do I have to tell you that the sun does not revolve around you? All you do is talk about James this and James that. Stop it already! The family already heard you call yourself a turd for years, now enough already!